Although a good idea on paper, the dinosaur petting zoo attraction didn't work out quite as planned. Let me begin by saying that I'm a huge Jurassic Park fan. I loved the book, I loved the first movie, and I even went to the second and third movies though I knew how bad they were going to be. Universal could have filled a rubber dinosaur head with dog turds, set it on fire, and called it Jurassic Park 4. And you know what? I'd probably have pre-ordered a copy. Needless to say, Universal Interactive had to do very little to win me over. And yet I sit here having beat everything the game had to offer still feeling unfulfilled. Surely this was not an attempt to ship a substandard game out as quickly as possible while slapping the Jurassic Park logo on it to sucker chumps like me was it? Say it ain't so! In keeping with the Zoo/Theme Park/Airport/Brothel Tycoon series, you are charged with the task of building a Jurassic Park from the ground up. Everything from park security to bathrooms is your responsibility. Unfortunately, theres only about 25 buildings total, which makes your park somewhat limited in stuff to do. To give the game an authentic feel, the game designers used the music from the movie as well as the actors likenesses. Graphically, the game comes pretty close to the movie (although only Alan Grant has the only picture that looks anything like the actor that played him). Dinosaurs are well textured, and with a free rotating camera they can be seen at any angle. They move and act like you would expect a dinosaur to do so, and will even do things like crash through the fencing or jump over it should they get the chance. This was my first game, so I tried not to repeat the mistakes of my predecessors in the movie. All dinosaurs were enclosed in high security fencing, regardless of how dangerous they were. I even built little fenced in enclosures between the attractions so if the main fence was breached, the dinos wouldnt get the chance to mix and eat each other. Plenty of rangers were on hand to provide protection, and aside from the occasional tornado (spawned in the middle of the ocean?? ), a good time was had by all. No dinosaurs escaped, and no visitors were harmed. Okay, the last game went a little slowly, so I decided this game to spice things up a bit by only building low security fencing. This way visitors would still be protected, but the dinosaurs would have a chance to accidentally escape and eat visitors for my own amusement. I still gave them plenty of food and water to keep them happy and made sure they didnt contract rabies and kill each other (the dinos, not the tourists). Since I had already completed several of the missions, I knew that raptors could climb low security fencing. After making sure my park was a recipe for disaster, I sat back and waited for the show to start. However, I seemed to have made the dinosaurs a little too content, since they stayed in their cages and no amount of prodding on my part would make the little bastards move. Before I had a chance to rethink my strategy, I reached my fifth star and won the game. No dinosaurs escaped, and no visitors were harmed. Going back to the manual, I discovered my previous mistake. Animals only attack when deprived of food or water, become stressed (although the manual is unclear how to reduce the stress of being a dinosaur. Counseling perhaps? ), or if they contract a disease. This time I bred more dangerous dinosaurs and placed them in low security fencing. No food dispensers or lakes were put in their cages. When one dinosaur developed rabies I quickly airlifted him into the T-Rex paddock. Now I had a group of the most dangerous killing machines on the planet, starving and rabid in low security cages. If THIS didnt cause havoc, I thought, nothing will. One T-Rex, unable to take it any longer, started to charge the fence. As soon as he was about to roll right over it, another T-Rex came up and killed him! Then they all started having seizures and flopping around on the ground and I was stuck with a cage full of comatose dinosaurs. Elle Sattler pleaded with me to revive the dinosaurs, but I was too depressed to muster the energy to click yes. Despite the days events and the fact that my star attraction had been reduced to diseased lifeless bodies bloating in the topical heat, I still managed to get my 5th star. No dinosaurs escaped, and no visitors were harmed. By this point I had become rather angry at the game for depriving me of the most exciting part of Jurassic Park. I created my new park with an eye towards a high civilian body count. Only the most dangerous carnivores were bred, and cages were built next to heavily trafficked roads and concession stands (no bathrooms either BWAHAHAHA). I created long Land Rover trails through the T-Rex and raptor cages, and made sure they went by areas where I had put dinosaur lures. A couple of land rovers were attacked, but none of the dinosaurs seemed the least bit interested in escaping. I even tried "retiring" the tourists and park personnel, but apparently it was Free Kevlar Vest Day at my park because the shots from my high powered sniper rifle didn't seem to bother them one bit. Finally, I had had enough. I destroyed the cages and put lures on the road. When the dinosaurs headed towards the lures, I rebuilt the cages behind them, trapping them in the visitor area. Although it was entertaining to watch the little tourists run for their lives, I had to put entirely too much effort in to manufacturing the disaster. Most of the dinosaurs escaped with heavy prompting, but despite my best efforts only a handful of visitors were killed. Bastards. 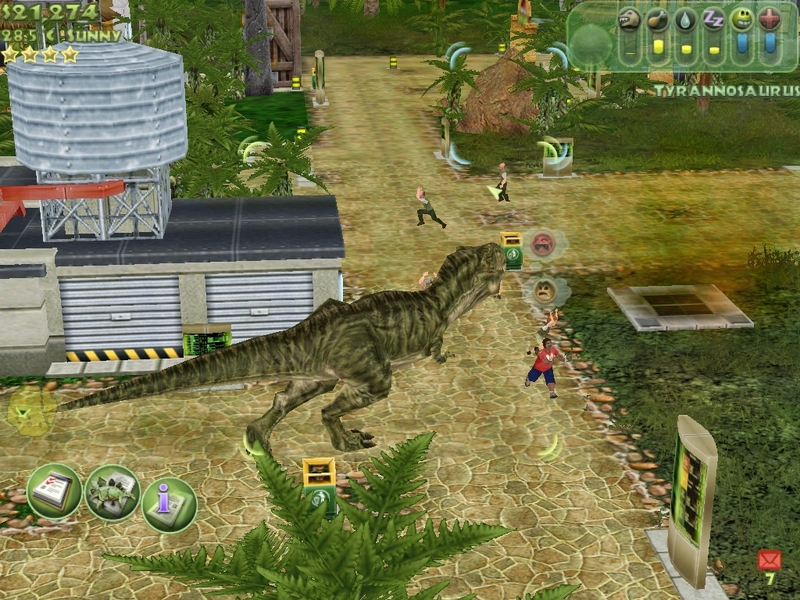 Graphically, Jurassic Park: Operation Genesis is a pleasing game. However, the heart of all management sim games is dealing with problems that crop up. Jurassic Park offers little in the way of fun because once everything is up and running, it generally stays that way. The side missions are fun, but have little replay value and certainly are not enough to prop up the game. In short, although Jurassic Park is a great simulation of a dinosaur tourist park, its just so boring that no one would want to play. GamingHyena gives Jurassic Park: Operation Genesis 6/10.